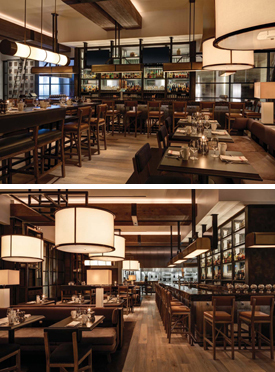 On the ground floor of the historic PSFS building in Philadelphia, the Bank & Bourbon restaurant takes inspiration from the rich history of the building along with a bourbon theme to create a space imbued with character, decked out with authentic finishes and highly detailed custom millwork. An open display kitchen with charcuterie station shows off the chefs’ skills, while a large chef’s table nearby provides a great way to entertain small groups with private tastings or special menus. A secret, private bourbon tasting room, accessed through a hidden bookcase door, offers an intimate gathering space for special guests. 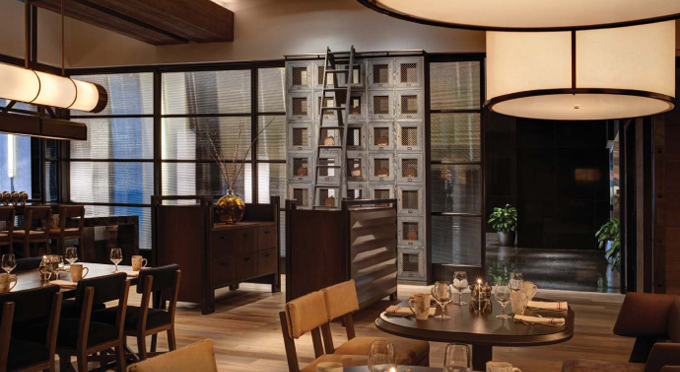 Custom-designed blackened steel and glass partitions divide the space, or offer one larger or two smaller private dining rooms.